This news report appeared in the Straits Times, 14 March, 2009. Please note the highlighted part. Is the PAP activist right? Can the PAP just “move out” the “weakest link” in a GRC according to their whims and fancy? 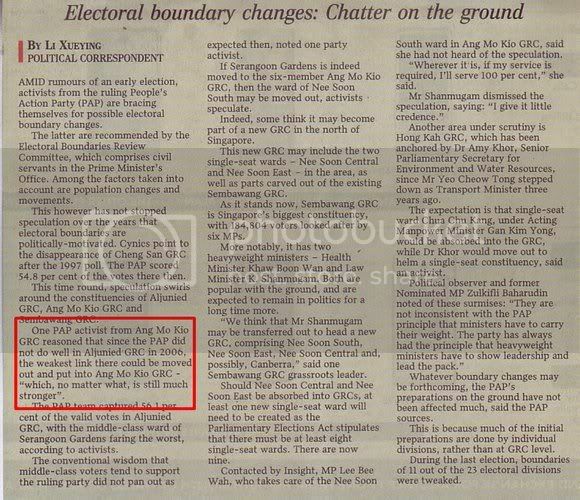 Or are even PAP’s own activists and members confused about the reasons for electoral boundaries changes? Or perhaps this proves the suspicion which many have all along – that boundary changes are to help the PAP win constituencies more easily? Or is the activist referring to the weakest member in the GRC team being moved elsewhere? This is unlikely as the report is about electoral boundary changes and the preceding and following paragraphs to the activist’s remarks talk about the weakest wards for the PAP, such as Serangoon Gardens. In any case, a subsequent paragraph in the report says: “If Serangoon Gardens is indeed moved to the six-member Ang Mo Kio GRC…” This clearly shows that the activist was referring to the moving of wards, and not personnel or candidates. Special thanks to Tan Kian Hwee for highlighting this to us. Read his take on the issue here. Read also: “Taking it easy” by Yaw Shin Leong.